This is a set of 8 laser engraved stainless steel washers for tossing and pitching. Engraving is done on both sides and clearly distinguishes one competitors washers from the others. Their outside dimension is 2.5". Their inside dimension is 1.0". They are the standard size, weight, material, and dimensions demanded by competitive washer players and are the type required to be used at the biggest tournaments around the world. They come in a medical grade polypropylene resealable container so that they stay together and secure between uses. Buy the best & forget the rest! 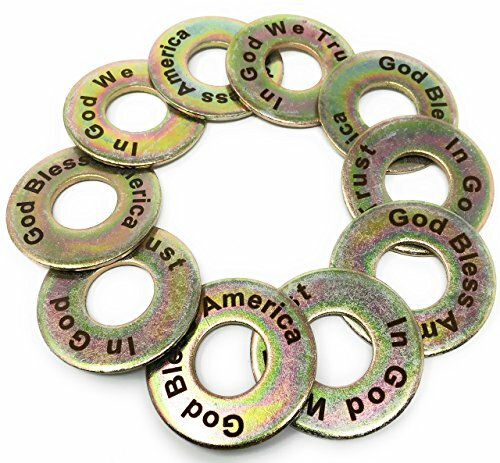 LASER ENGRAVED: 10 Yellow Zinc Coated Steel Washers Laser Engraved On Both Sides To Distinguish Between the "In God We Trust" Player And The "God Bless America" Player. EXCELLENT MATERIAL: Yellow Zinc Coated Steel Washers Resist Rust, Won't Break, and Don't Chip Like Coated, Painted, or Plastic Washers. Buy The Best & Forget The Rest!